Other Common Names: Absinthe, grand and common wormwood, green ginger, madderwort, old woman, absinthium, ajenjo. Habitat: Wormwood is indigenous to the temperate climate zones of Europe, northern Africa, and western Asia. Currently, it is cultivated commercially in many parts of the world including central and northwestern United States. Plant Description: Wormwood is a perennial shrub-like plant of the aster family (Asteraceae). The roots or rhizomes produce firm stems which are covered with fine delicate hairs. The leaves are green with a hint of gray and the flowers are yellow that bloom during summer. The plant can grow up to one and a half meters in height or three feet. Plant Parts Used: The leaves and the flowering tops – collected in July and August and then dried naturally or by artificial means. 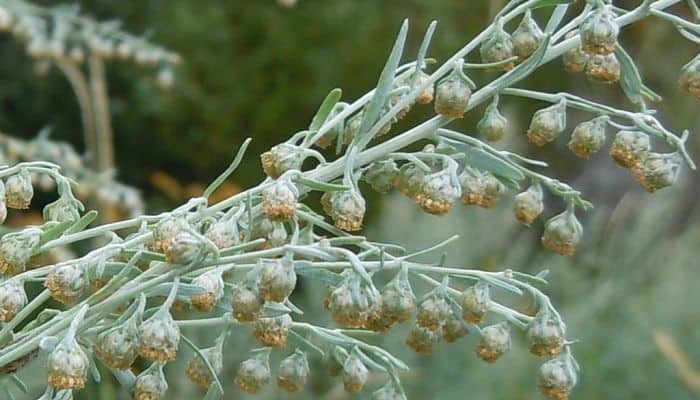 Wormwood is one of the most bitter herbs there is. Some of the active substances found in wormwood are thujone, silica, tannins, flavonoids, and inuline. It also contains the anti-inflammatory agents absinthin and anabsinthine that gives this plant its bitter taste. The bitter substances absithin and anabsinthin are thought to improve digestions and stimulate the digestive system which explains this herb´s use as an herbal remedy for gallbladder, liver and stomach ailments. It has been used traditionally as a natural treatment for irritable bowel syndrome (IBS), colds, chronic fever, heartburn and to enhance the immune system. To hide its bitter taste is usually mixed with other herbs like peppermint which has more agreeable flavor. This herb has mild anti-infective properties and has been used topically to treat wounds, cuts, and bruises to speed the healing process and prevent infection. Due to the slight natural anesthetic effect of the herb, it has been used to ease pain associated with arthritis and rheumatism. An extract made from the plant has been used for centuries as an herbal medicine to rid the body of intestinal worms like roundworms and pin worms hence the name wormwood. 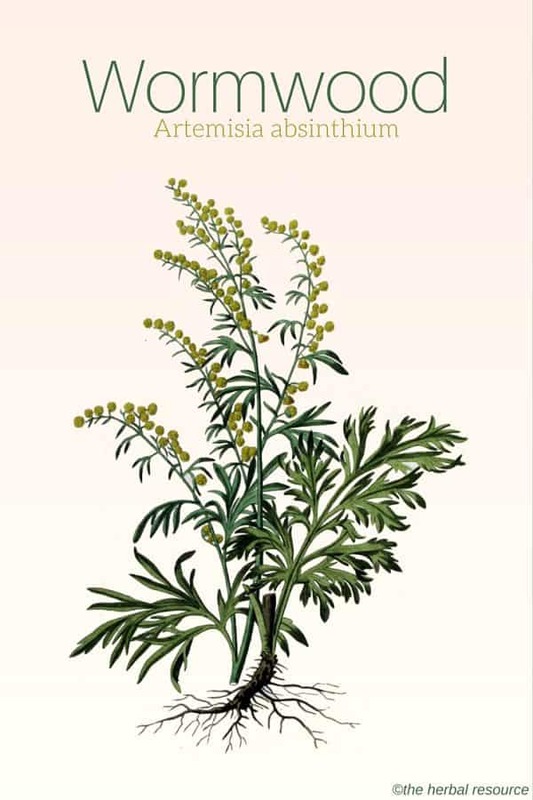 Wormwood has been used as a traditional remedy to promote menstruation by improving blood circulation. Additionally, it has been used for menstrual cramps and to ease pain during labor. 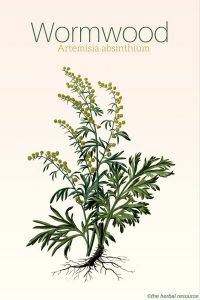 Because of the bitter properties of wormwood it stimulates appetite and explains why it has sometimes been used to treat anorexia. Wormwood is thought to have a calming effect and could be helpful to those suffering from epilepsy and muscle spasms and to treat mild forms of depression. Not only has this plant its uses as a medicinal herb but it is also used as an insecticide and an insect repellent. This herb is used as a principal ingredient in the production of the alcoholic drink absinthe. Absinthe has been banned in many countries including the US due to thujone, a chemical found in the plant, which can be potentially toxic at high levels. Absinthe is still available as an alcoholic beverage in the European Union as long as the thujone content is less than 35 mg/kg. Wormwood is mostly taken as a tea or tincture. Wormwood tea: 2.5 to 5 grams of the dried herb to 250 ml of boiling water. Steep for ten to fifteen minutes. Three cups a day is often recommended by herbalists for medical purposes. As a tincture: 10-20 drops are added in water and usually taken before meals. The use of wormwood as a medicinal herb should not exceed four weeks. Because of thujone found in this herb, it is considered unsafe if taken in large amounts over long periods of time (over four weeks). Excessive use can cause stomach and intestinal cramps, vomiting, nausea, dizziness, headaches and nerve damage. Women who are breastfeeding or pregnant should not take wormwood in any form. 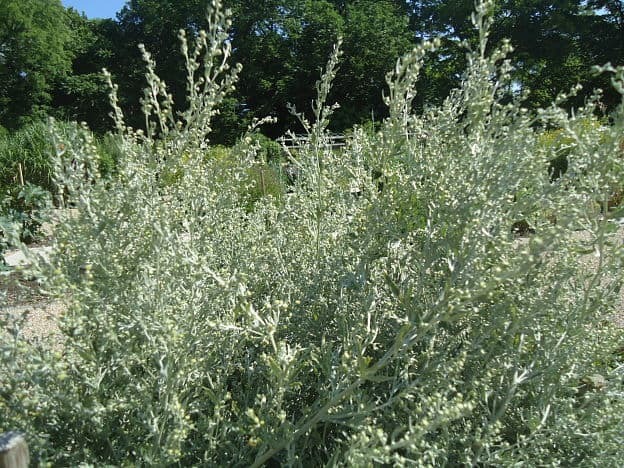 Those who are sensitive to plants in the Asteraceae family can get an allergic reaction to wormwood. Plants in this family include marigolds, daisies, and ragweed to name a few. People who are on medication (Anticonvulsants) used to prevent seizures should not use it as it may interact with those medications. This herb should only be taken under the guidance of a professional health care provider who is knowledgeable in herbal medicine.